Gourmet burgers are everywhere these days, with restaurants constantly trying to out-do themselves. Whether you believe the perfect burger lies in the ever so slightly toasted (brioche) bun, the quality of the meat, the cooking (medium-rare, or nothing at all), or the addition of speciality sauces, South Bank has enough choice for you to find your way to burger nirvana. Read on for our pick of the crop. Decidedly un-French, "le burger" is surprisingly the top selling dish in French restaurants according to recent studies. Even for the most conceited gastronomes, how can you argue with the deliciousness of melting cheese, the soft pillowy bap, the crunch of a gherkin juxtaposed against hot, char-grilled beef patty? No, one cannot. Even head chef at Brasserie Joël, South Bank's highly regarded French Brasserie (which holds 2 AA rosettes for culinary excellence, no less) can argue with this, which is why the humble burger figures on the menu. Brasserie Joël's Black Angus beef burger is to die for. 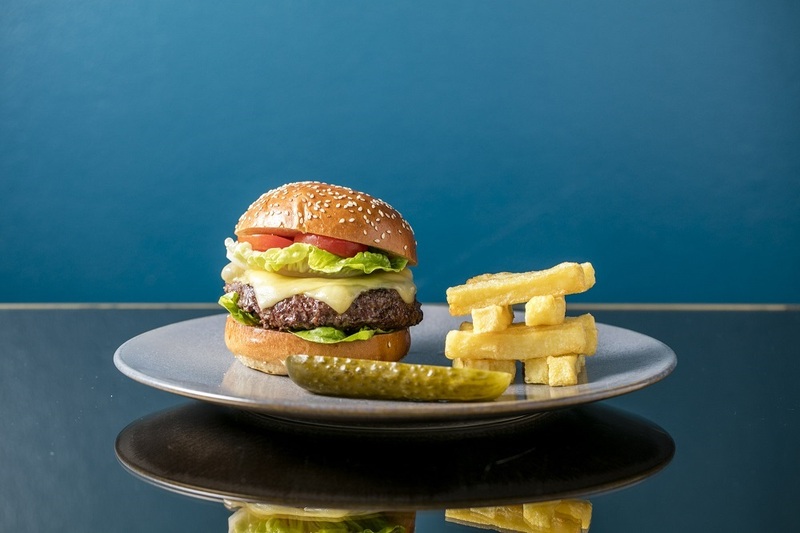 Now if you're feeling rather decadent and want to treat yourself on your lunch break, head to OXO Tower, whose team have ingeniously crafted the best, speediest burger you'll ever encounter, perfect for that pesky clock-watching boss of yours. It'll come out in a jiffy - allowing you time to sit back and enjoy your full lunch hour without the stress of getting back late. Head Chef Keir Barry’s moreish gourmet burger is served with the satisfying accompaniments of crispy pancetta, Cheddar cheese, pickled gherkin, BBQ sauce and triple-cooked chips. Bleecker Burger is one of Southbank Centre's street food pop-ups and has fast made quite a name for itself. Freshly made using dry-aged, rare-breed, pasture-fed beef from small farms across the UK, and served in true street-food style from their trademark truck, Bleecker burgers are in a class of their own. Bleeker burgers started back in 2012 with Zan Kaufman, a New York lawyer who decided to pack it all in and move to London to sell real NYC style burgers to us Brits. Now, Bleeker has a kiosk in Old Spitalfields Market, a 12-seater takeout joint in Victoria and a new opening in East London too. However, Bleeker started right here in South Bank and its at its home you can find some of the best burgers in town. Jimmy Garcia has opened pop-ups all across London with a variety of concepts and now he's back with the BBQ Club & Bar, serving up gourmet BBQ dishes, BBQ lunch boxes, delicious side dishes, and a showcase in BBQ cooking. Try his Aberdeen Angus Steak Burger with caramelized onions, smoked cheddar, homemade pickles, and roast garlic mayo, served in a toasted brioche bun. Located in the old headquarters of the Greater London Council (GLC), the London Marriott Hotel at County Hall lives and breathes history. Its restaurant, Gillray's, has views directly on to Westminster and the Houses of Parliament, just over the stretch of the rippling river Thames. The menu features locally sourced and seasonal produce at its best, with the majority of products from within 150 miles of the restaurant using Kent and Essex based farms. Try the Gillray’s Steak Burger: 280g British beef, ‘lyburn’ oak smoked cheddar, streaky bacon, dill and pickle. The Green Room is a casual neighbourhood diner, bar and garden created by local social enterprise Coin Street Community Builders and the National Theatre. Inside you'll find an airy, contemporary space featuring props and scenery recycled from National Theatre shows. Surrounding The Green Room is an urban oasis: a sustainable garden. Perfect for summer dining and burger-devouring. It should also be highlighted that the Green Room's veggie burgers are a thing of beauty and pure joy to eat. With beetroot sauerkraut & crushed avocado, it's a popular choice for veggies and non-veggies alike. Isn't the National Theatre good? Not only do they show high quality, amazing theatre, but they also have a fantastic panoply of exciting foodie pop-ups throughout the summer, allowing you to relax in the shade of its awesome architecture and soak up the buzz of South Bank. Brisket + Bird is served up from an American Airstream-inspired caravan which is exciting in itself - but when you see the food: slow-cooked beef brisket baps, Asian-style pulled chicken, chicken salt fries and amazing burgers - now there's the ticket. If you're looking for a bit of a posh setting for your burger consumption, then we recommend Skylon. THE place to go on a date, a nice lunch with friends or dinner with a view. Skylon is located inside the Southbank Centre with floor-to-ceiling windows that frame the river views, with an airy, Modern European feel and 1950s design touches. If you want quality ingredients, a delicious burger and artfully stacked chips, then this is the place to be. Staying at Park Plaza County Hall in South Bank? Or even if you're in the area and looking for a relaxed, welcoming vibe that's a bit removed from the crowds, we can recommend Spectrum Bar and Café, who offer a best-selling "South Bank Cheese Burger". With aged cheddar cheese, tomato, pickles, and relish (and bacon as an additional optional topping), it's a good'un. Again, another burger-based gem can be found at the Southbank Centre's foodie pop-ups! Head to Jacob's Ladder if you like to know exactly where your meat comes from. All of Jacob's Ladder meat can be fully traced back to either Jacob’s Ladder Farm or one of a handful of farms that supply Jayne and Michael. They do their own butchery and prepare their own burgers. The burgers have great depth and complexity of flavour because all the farms that they work with only grass feed their animals. The meat is then dry-aged for at least three weeks. This deliciousness is then enrobed in an organic brioche bun that’s toasted and drizzled with virgin olive oil and is then topped with either a raw milk blue Stichelton or an organic, raw milk yellow Hafod cheese. Woodwards Farm specialises in high-quality meat and they go to extraordinary lengths to make their burgers the finest in town. When Will and Kerry hand you your gourmet burger, you’re getting it from the hands of the same people who raised the cows and grew the wheat and grass they feasted on. The beef is hung on the bone for three weeks, then they seem cut the beef (a continental style of butchery which cuts around the muscles rather than slicing straight through them). They bind the burgers with their own free range eggs. Can be found outside the Southbank Centre as one of their pop-ups.